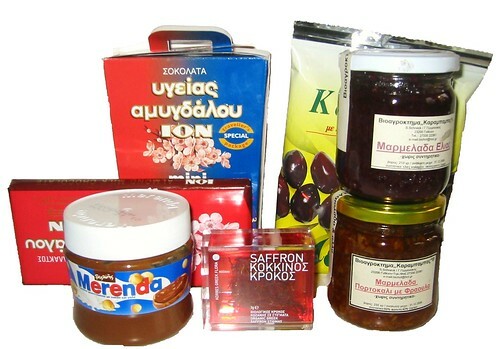 Here are some items I brought back from my journey in Greece: some local chocolate, some Merenda, the Greek counterpart to Nutella (Maybe I should write a post about some kind of chocolate cream blindtasting, I still have some luxury chocolate cream from Fauchon left), some Kalamata Olives of course which will go straight into my Horiatiki (Greek salad with tomatoes cucumber, onions, feta and of course olives); also a glass of orange strawberry marmalade and a glass of olive marmalade from a food shop in Nafplio. The orange strawberry marmalade tastes as bitter as it should. The olive marmalade tastes a little weird to my palate used to salty olive cream. Actually it tastes like a sweet tapenade. I won’t eat it for breakfast for sure! Finally a small box with saffron from Kozani (city in Northern Greece) which simply looks good and I will make good use of for sure.